The National Environmental Policy Act is intended to promote environmental considerations into federal agencies' decision-making processes. 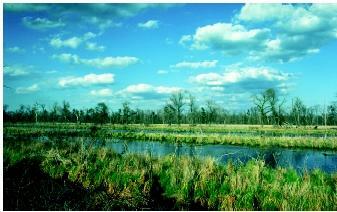 Impacts on wetland systems (shown here) often are the subject of NEPArelated processes. culprits of environmental degradation, and that federal and state agencies would continue to support such projects unless Congressional statute forced them to consider their negative environmental impacts. SEE ALSO Balancing Diverse Interests ; Environmental Movement, Role of Water in the ; Land-Use Planning ; Legislation, Federal Water ; Public Participation . Council on Environmental Quality. <http://www.whitehouse.gov/ceq/> . Federal Register. U.S. Government Printing Office. <http://www.access.gpo.gov/su_docs/aces/aces140.html> . U.S. Government's NEPAnet. <http://ceq.eh.doe.gov/nepa/nepanet.htm> .